Choosing Eco-friendly ABS, durable nylon leash and chrome plated snap hook to ensure long time use. Durable core system can cycle in and out at least 30,000 times. Other materials are at least 3 times stronger than normal designs. Every detail is necessary for our brand. More happiness achieved via tangle free design for pets to enjoy smells and sounds of outside. Soft-grip handle is designed to make you comfortable and reduce hand strain caused by long walk. Quick stop-and-release system works smoothly to let you always stay in control. 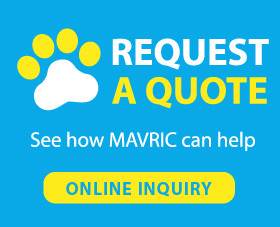 -Mavric, a professional pet products manufacturer, offers all types of dog leashes. 1 year warranty is offered by us. If you have any question about pets or products, please feel free to contact with us. What Should I Prepare for Winter Dog Walking? As outdoor is chill in winter, pets might not go out frequently like usual. So preparing a sweet and warm home for them is very important in winter. Choosing a nice designed bed, mat or doghouse for your puppy can make him feel happy. A comfortable bed can release the stress and reduce the pain of joints, especially for some elder pets, a soft bed can do make them feel better. A good bed can prevent them from cold of floor, which can keep their health as well. When they come back from cold outdoor, imagine how happy they will be to lay down on a comfortable bed.